As the evening draws on, there’s not much time for floating voters to make up their minds, as the polls close at 22:00. So far our social media looks like this. Labour are the most popular social party. The Tories and Lib dems are almost invisible. This could mean one of two things: primarily Labour have been way more active on the social media platforms than the other parties or secondly, because labour are more popular amongst younger voters, who are naturally more active online than the typical voters of the other parties. 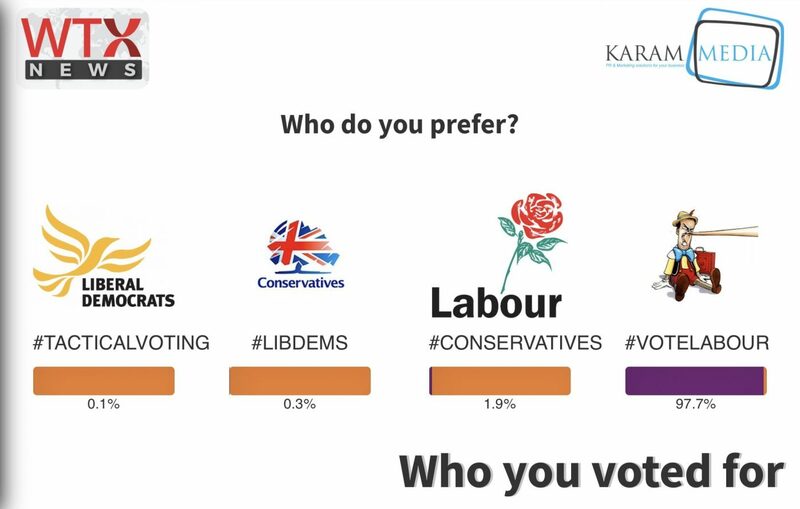 Our polling platform scours twitter and collates all the voting trends, where specified. We then tally and visualise the results for you. This poll may not reflect the winner but provides an indication as to how popular the parties have been on polling day. We will update with a more comprehensive poll shortly after the polls close at 10:00 pm BST, once the polling booths close. Stay up to date and connect for the latest poll later tonight. Polling Data provided by Karam Media.